Enjoy your entertainment in traditional Southern style with this Entertainment Console. The piece boasts a darker wood finish that pairs beautifully with the intricate woodwork and decorative hardware and creates that traditional atmosphere you're sure to love. As storage goes, you receive two middle drawers and two end doors with an adjustable shelf behind each. Furthermore, there are three top open compartments with cord access cutouts perfect for all of your media devices. The New Charleston Traditional Entertainment Console with Adjustable Shelving by Broyhill Furniture at AHFA in the area. Product availability may vary. Contact us for the most current availability on this product. This collection of dining, living, and bedroom furniture will give your home that traditional look only found in the South. 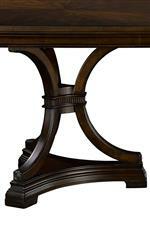 With a bold dark wood finish and decorative features such as diamond and medallion accents, curved saber legs and intricate woodwork, there's so much to love about this collection. 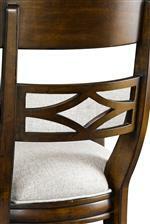 The New Charleston collection is a great option if you are looking for Traditional furniture in the area. 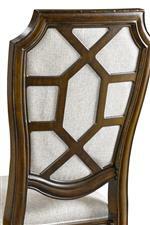 Browse other items in the New Charleston collection from AHFA in the area.